When I took on an apprentice towards the end of 2014, I considering writing my own apprenticeship agreement. I did a bit of Googling and made some notes, but in the interest of BNI I decided to have a chat to Pam. After our first meeting, her questions made me realise that this was perhaps not something that I should attempt to do myself. At our second meeting, Pam and I went through the first draft of the agreement and she also produced three documents that I hadn’t even considered having: A Social Media policy (rather important considering the nature of our business), Disciplinary and Capability Procedure and a Grievance Procedure. These cover such vital points that could have left me and my company vulnerable without them. I can’t recommend Pam highly enough. She is very knowledgeable, professional and understanding. She never belittled my knowledge (or lack there of) of the law, instead she went to great lengths to make sure I understood everything. 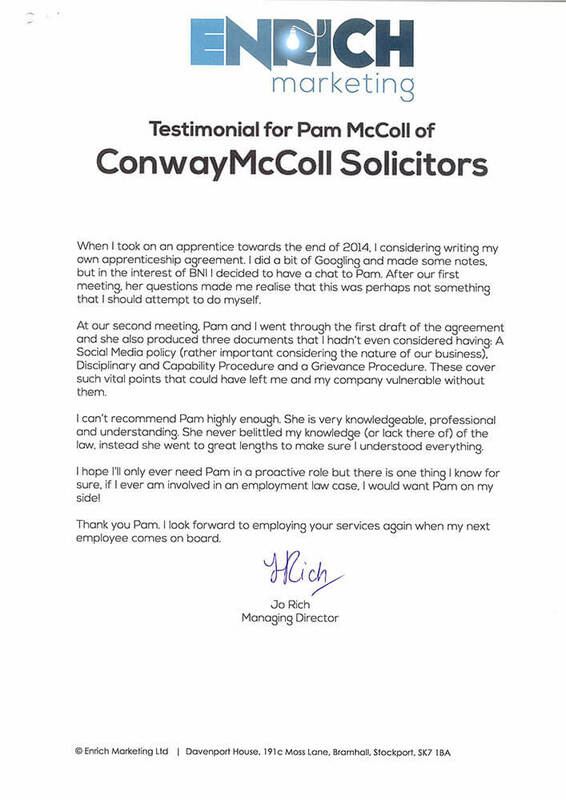 I hope I’ll only ever need Pam in a proactive role but there is one thing I know for sure, if I ever am involved in an employment law case, I would want Pam on my side! Thank you Pam. I look forward to employing your services again when my next employee comes on board.